The iconic Kelvin Hall in Glasgow hosts sports facilities, museum collections and also the National Library of Scotland (NLS) Glasgow site. On the afternoon of 9thMay a group of us were lucky enough to be given a tour of the NLS at Kelvin Hall, which holds the Scottish Moving Image Archive, and also provides access to the vast NLS digital collection. We were a mixed group of librarians from the academic, verejnosť, non-profit and private sectors. After introductions, our host Ann and colleagues Liam and Fergus led us through the public space. It’s a welcoming area with a dramatic giant screen showing clips from the Moving Image Archive. The archive holds films and videos capturing over 100 years of Scotland’s history. We saw fascinating cinema artefacts, including actual vintage cinema seats! Visitors can wander in and sit themselves down to view some of the films which have been curated into themes like Sport, Glasgow, Health, and Retail. My particular favourite was footage of an early 20thCentury football match between the Married Ladies and Single Ladies of Portsoy, Aberdeenshire! The National Library of Scotland is one of six legal deposit libraries that can claim a copy of print and digitally published material in the UK. The print copy is held onsite in Edinburgh. Však, with more and more legal deposit items arriving in digital format, NLS at Kelvin Hall users benefit from also having access to this content onsite in Glasgow. Mimochodom, there is much content available online for anyone to access outside the Library, but due to licensing restrictions there is more on offer for in-person visitors to the NLS in Edinburgh or at Kelvin Hall. We were shown how visitors use the NLS catalogue themselves at modern terminals. They search for and access many of the NLS digital resources, which include the British Newspaper Archive, and business databases such as Mintel, Factiva and Bureau van Dijk’s ORBIS and FAME. The digital collection also holds books, manuscripts and maps. An amazing resource, most of which users don’t even have to register to use. 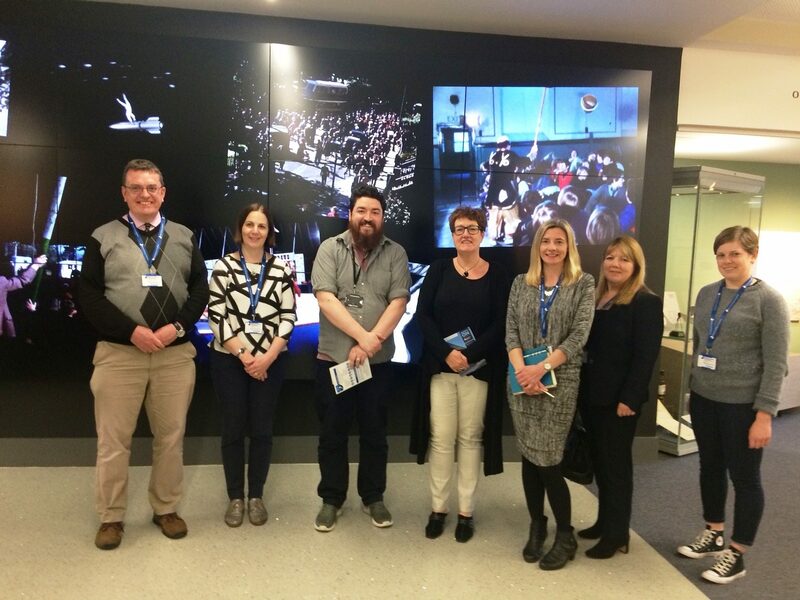 We were then shown some of the rooms used for viewing the gems from the Moving Image Archive, and for learning and outreach with specific user groups. We were taken to the staff only areas, and shown the vaults containing film, videos and papers from the Moving Image Archive. Ann described the difficulty of classifying film when there can be different copies and separate excerpts of a moving image item. We learned how the archive seeks to preserve original film, digitise it and store it. We visited the workshop where digitisation happens. There was some intimidating-looking equipment in there! Ann had also set up a rare treat for us – an actual 35mm film playing. The video preservation room contained video players for every video format imaginable (until then I thought there was only VHS and Betamax!) We heard about the current project to digitise the news output from Grampian television from the 1980s through to 2000. After the tour we were treated to tea and biscuits. Pre mňa, this was a rare and very welcome opportunity to network with colleagues from other library sectors. It was gratifying to hear that my academic counterparts face the same impossible demands for access to expensive content as I do in the private sector! I also picked the brains of one the Glasgow University librarians about how he promotes information literacy. Many thanks to John Coll from SLA Europe for organising this valuable event. Thanks also to Ann, Liam and Fergus from the NLS at Kelvin Hall for giving us such a warm welcome and for sharing their fascinating work. As Liam said, only partly in jest, he gets to watch films for a living. Me – jealous? ?